The decision to stop operating the app is because there are not enough users of the app. It’s not because the New York Times is unpopular. In fact, its apps for Android and the iOS are doing quite well. The anemic usage is attributed to only a few BlackBerry users who are going to the BlackBerry App World and downloading it. This is bad news once again for the beleaguered Research in Motion. 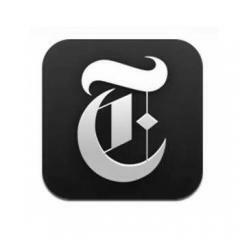 The New York Times’ decision is likely going to scare away other developers who are planning on making apps for the BlackBerry environment. Those who are already in the fold or currently developing apps for it will definitely be shaken by the news as well, thinking that this is another sign of a fast sinking ship. According to New York Times spokesperson Eileen Murphy, “It’s a matter of usage of our apps, and we dedicate our resources where we think there’s the highest level of usage. Murphy further shared that they have seen a drop off in usage of their BlackBerry app. This is not likely to bode well for the upcoming BlackBerry 10. A robust mobile app store is one of the key factors that attract new users. With the New York Times pulling out of BlackBerry it will likely have repercussions down the line and the ultimate victim may well be BlackBerry itself.